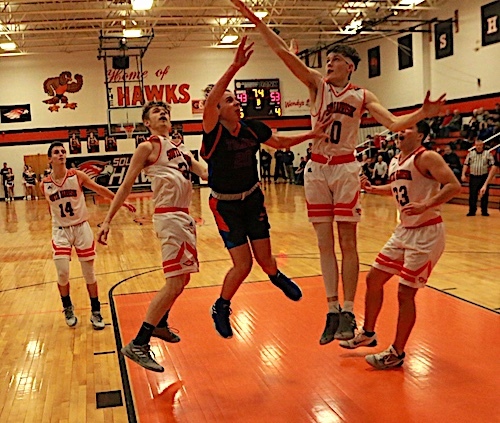 LOST CREEK, W.VA. — Tolsia ( 12-4 ) will play for a West Virginia Hometown Invitational Tournament Championship next weekend after a 72-61 victory over South Harrison ( 12-3 ) Saturday evening at the Hawks Nest. Jesse Muncy draining a 25 footer in the first quarter at South Harrison. Tolsia stormed out to 24-16 lead after one period behind 13 points from Jesse Muncy who fell awkwardly on the last play of the quarter and did not return to the game. The Rebels hit 4 three pointers in the quarter. 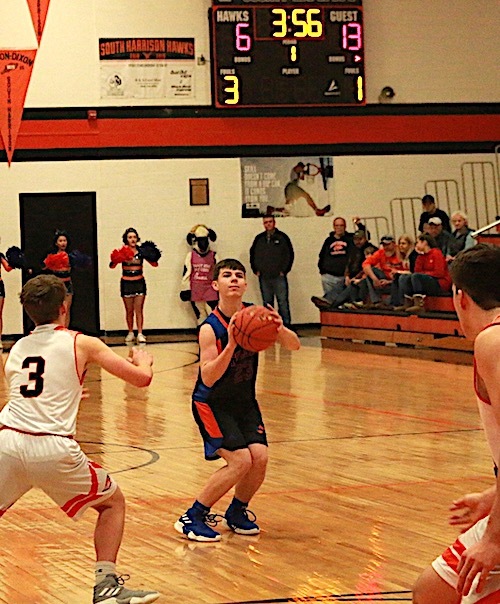 In the second quarter the Rebels relied on strong bench play as Zane Sturgill and Zack Ball scored 4 points and 2 points respectively along with Gavin Meadows to keep the Hawks at bay and Tolsia led 35-25 at Halftime. Tyler Johnson with the tough finish in the lane vs South Harrison. The thied quarter saw Jacob Mollette, Rob Cantrell and Tyler Johnson score 18 of the team’s 20 points as the Rebels extended their lead to 57-45 headed to the final stanza. In the fourth it was Gavin Meadows scoring all 7 of his points and the Rebels icing it down the stretch by hitting 11-13 from the charity stripe to close out the semifinal victory. Rob Cantrell with the hoop and some harm late in the game against South Harrison. Rob Cantrell paced four Rebels in double figures with with 16 points, Jacob Mollette and Jesse Muncy contributed 13 points apiece, Tyler Johnson netted 10 points, Gavin Meadows and Austin Salmons 7 points each, Zane Sturgill 4 points and Zack Ball 2 points. Tolsia hit 7 three pointers and went 17-22 from the free throw line. 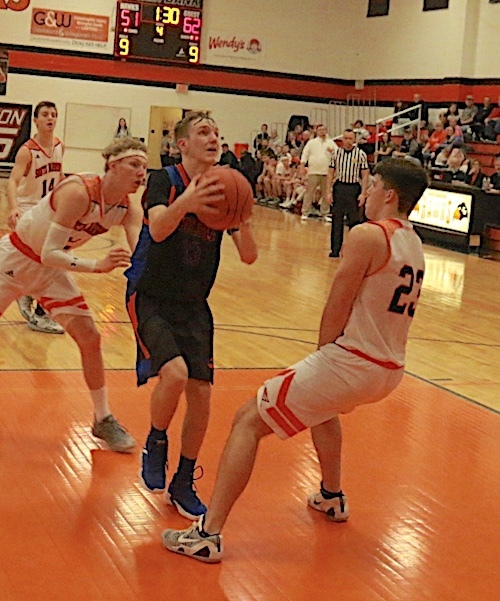 South Harrison was led by Brenton Barnette with 23 points. 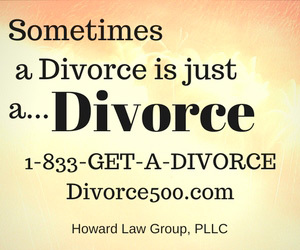 The Hawks hit 3 three pointers and went 14-18 from the free throw line. Tolsia will play Class #4 Greenbriar West ( 13-3 ) at 8:00 next Saturday night for the WV HIT Championship at Robert C. Byrd High School. South Harrison will play St. Mary’s at 5:00 in the third place game also at Robert C. Byrd. The Rebels will return to action Tuesday at Rebel Arena for Senior night at 6:30 vs Grace Christian and then travel to Class 3A #6 Cabell Midland Wednesday night at 5:45 and 7:30. GLENN MOLLETTE: Virginia Governor - Is Anybody Safe?